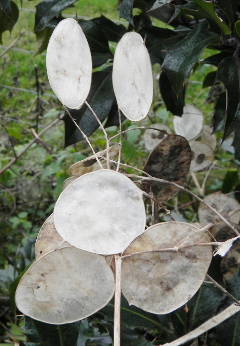 Honesty, in Winter. Shall I write a novel do you think? I think it’s too long to make a good song title. Billy Joel and Harry Hess (Harem Scarem) just called their songs ‘Honesty’, as did many others who wrote using that title. Wikipedia even remembers a horse called Honesty in the 1842 Grand National – what a long memory it has. To be honest, I can’t remember if the horse came in anywhere. Some people say that it’s the phase of its life shown in the photo that won it its name. When everything is so open and overt, well, you have to be honest, don’t you? It’s certainly the least complicated way to run your life. When you leave your seeds prominently displayed in transparent seed pods, while the rest of the plant dies back you better be honest. It’s also called Silver Dollar and Chinese Money. In Europe its various names translate as Judas pennies, pieces of silver and all that. Money didn’t make it big to start off with – it was another one of these ‘overnight success that took twenty years to achieve’ acts. The first coinage was gold and gold is just too heavy to cart around as lose change. A Silver Penny appeared in the Middle Ages, with a cross marked on it, not to show any religious affiliation but so that it could be easily cut into four to make it more useful. The big trouble with a coin is how much it costs. It is expensive to make (our ‘coppers’ are currently made of steel coated with bronze) and it’s expensive to handle. In fact, the lower denomination coins can cost, over their lifetime, far, far more than they are worth either as coinage or just plain metal.